Neuro-theatre has been an obsession of mine since 2006, when I organized a festival of performances about neurological conditions called NEUROfest. I was brought up in a family that combined science and art in their careers and hobbies. My mother is a visual artist and a PhD psychologist, my father studied chemistry and English literature before moving on to law, and my grandfather became famous for co-discovering the Rh factor—the blood protein notated as positive or negative in all blood types—but was almost equally enthusiastic about his amateur songwriting. On my end, I was intrigued by neurology and its theatrical possibilities. There is something innately theatrical about humans in extremes, and neurological conditions bring us to those extremes. What I didn’t realize back then was how their parameters suggest theatrical forms. The constructions of our thoughts, or perhaps of the methodologies of our cognition, suggest their own metaphorical structures onstage. Those can take various forms, but, as a brief example, it was a revelation to me that aphasia, a neurological condition that inhibits the use of language, comes in many types. One of those types is expressive aphasia, which affects the ability to speak, and another is receptive aphasia, which affects the ability to comprehend. So, for my play Linguish, which was presented at NEUROfest and handles the topic, I separated the characters into those who could speak but not comprehend and vice versa, in order to theatricalize the different sections of the brain responsible for those neurological functions. There is something innately theatrical about humans in extremes, and neurological conditions bring us to those extremes. Linguish at NEUROfest. Photo by Arthur Cornelius. As I worked on the festival, I began to see those implied structures come to life in most of the pieces that were being presented, not just my own. Since then, I have created a number of theatrical works that use neurology or neuroscience as their basis, from traditional theatre to opera to my current project, a multimedia performance called The Neurology of the Soul. And when going to see other works of neuro-theatre, I’ve seen the same pattern—the brain’s internal structures take life. Back in 2006, when my interest started, art that focused on neurology and neuroscience as its main subject matter was just beginning to appear in popular culture. Neurologist and author Oliver Sacks had had a few of his books adapted: Peter Brook developed a play based on The Man Who Mistook His Wife for a Hat, which was also turned into an opera composed by Michael Nyman, and Awakenings inspired Harold Pinter’s A Kind of Alaska, not to mention the Oscar-nominated movie by Steven Zaillian. 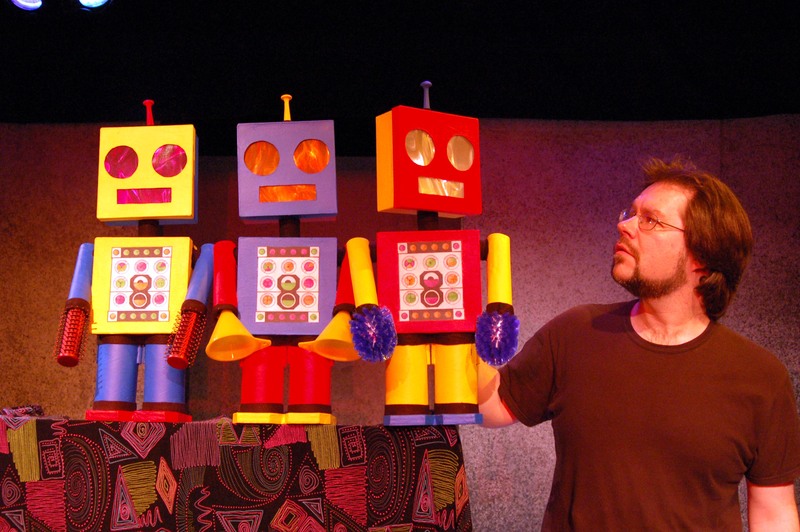 But when I mentioned to colleagues at the O’Neill Puppetry Conference that the protagonist in the puppet script I was working on, The Boy Who Wanted to be a Robot, had Asperger’s Syndrome, most hadn’t heard of the term. Of those who did, they knew it from the book The Mysterious Incident of the Dog in the Night-Time, which had not yet become a play. At the time, the term “Asperger’s” had not yet been replaced by “on the spectrum,” which is now preferred by many. Conditions like synesthesia were still at the edge of public consciousness. Tourette’s was known, but mostly used as a joke about cursing. Few people had seen the brightly colored pictures of an fMRI brain scan. The Boy Who Wanted to be a Robot. Photo by Arthur Cornelius. In the early theatre work that engaged with these subjects, theatrical innovation was already a hallmark. Brook brought his international troop (based in Paris but using performers from around the world) and his spare aesthetic to his Sacks adaptation, The Man Who. The script, written with his long-time collaborator Marie-Hélène Estienne, attempted an overview of a range of neurological conditions, creating a constantly morphing netherworld of brain function. In performance, the effect was at times confusing, but what came through clearly was the idea of characters beset by the mysterious inner workings of their brains. Other artists chose specific conditions. Nyman’s adaptation (written with librettist Christopher Rawlence) focused on the title dilemma of Sacks’s book, and the piece’s intricate but alienating music reflected the alienated experience of the character at its center. Arthur Kopit’s Wings, originally a radio play, created a soundscape that rarely became coherent, surrounding the interior monologue of an aphasic woman who could no longer comprehend language. Kirk Bromley’s Syndrome used his usual joyful logorrhea, reveling in its poetic excesses, to convey the excess of words that tumbled, unwanted, from the mouth of a man suffering from Tourette’s. Pinter’s signature pauses became the vast chasms of loss for the woman whose adult life had disappeared in A Kind of Alaska. Now, over ten years later, neuro-theatre is everywhere. There is a new emphasis on neuroscience as opposed to specific neurological conditions. My work is no exception, as the neuroscience of love is the subject of my current project. This emphasis examines the internal structures of the brain we all share. Brain structures have a beauty, and somewhere deep in that beauty lies a deeper insight into who we are as human beings. In one piece, The Female Role Model Project, an ensemble work led by Tjaša Ferme, EEG devices (which read and translate the brain’s electrical impulses) were placed on the heads of the performers and some audience members to capture their brainwaves. These were then projected for the audience to watch. The recent production at the 3-Legged Dog in New York City was engaging though uneven, but the possibilities of live video of the brain were exciting—taken further, I can imagine a production that is a complete reaction to the inner thoughts of the audience. There has been a lot of recent research on mirror neurons and how our brains reflect the emotions we see on stage, and using an EEG opens up the possibility of making that process transparent so that we can experience our experience: meta-theatre meeting meta-neuroscience. 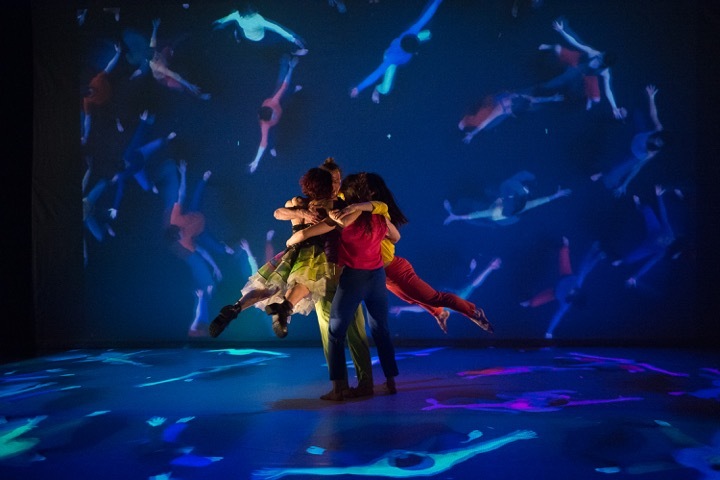 The Brain Piece, a dance performance choreographed by Jody Oberfelder, led audience members through an immersive installation at New York Live Arts. At the various stations, Oberfelder tried to engage the brain in different ways, using optical illusions to make us aware of how we perceive and using smell to stimulate the memory. Later, live dancers interacted with filmed dancers to imitate the structure of a neural network. Jody Oberfelder's The Brain Piece. Photo by Christopher Duggan. In Off the Top, presented at the Soho Playhouse, Baba Brinkman created a series of raps explaining and delving into mysteries of neuroscience, while his wife, neuroscientist Heather Berlin, presented the scanned images she had created of his brain while engaged in rapping. Brinkman moved to freestyle, and we saw how this sort of live quick engagement interacted with his neurological processes. This was theatre as science lecture, or vice versa, and the evening was as entertaining as it was informative. Another recent work that tackled neuroscience was Jon Torn’s The Scientist, a piece of reader’s theatre—a pared-down, dramatized lecture—which played at the So-Fi Festival. Accompanied by video and live music, Torn narrated the unique life of neuroscientist John C. Lily, who found ways to control monkey brains with electrodes and took part in extreme experiments with LSD in an attempt to see more deeply into his own consciousness. By transforming a lecture into theatre, Torn (like Brinkman) lets the two forms speak to each other, engaging the emotions while engaging the intellect. The most prominent recent production, and the most conventional, was of Tom Stoppard’s The Hard Problem at Lincoln Center. The title refers to the problem of understanding consciousness. But unlike many of the other productions of this genre, or even Stoppard’s previous work combining theatre with science (such as Hapgood and Arcadia), The Hard Problem plays like a relatively mundane drama. Though it is full of Stoppard’s usual sparkling dialogue, it suffers for its inability to match form to concept. Neuro-theatre demands innovation. Such a young scientific field needs to be complemented by productions that are shaped by the content. Neuro-theatre demands innovation. Such a young scientific field needs to be complemented by productions that are shaped by the content. An interesting conversation between Stoppard and cognitive scientist David Chalmers, who originated the term “the hard problem of consciousness”—the difficulty of explaining the reason why any organism is aware of its own experiences—highlights the lost promise of the play, because the concepts behind the problem of consciousness are fascinating. I have not yet seen Brinkman’s current work, Rap Guide to Consciousness, but perhaps it is more successful at tackling that same subject. What feels true to me, regardless, is that the number of productions matching neurology and neuroscience with theatre is hardly a coincidence. The connection between understanding the brain and understanding human behavior is apparent. As the fields of neurology and neuroscience expand and evolve, something needs to fill the gap between pure scientific analysis and what it means to us all as humans. What better medium than theatre to do so? Neuro-theatre seems to have evolved from simply being theatre on a specific topic to being its own sub- genre. Few artists work exclusively in it—which makes it clear that it is not an independent genre—though most people who do seem to create at least somewhat experimental work in general. Like much of this kind of work, neuro-theatre is usually innately structural and meta-theatrical. But its language is the language of science, full of beautifully complex jargon. At its best, it is also a deeply emotional form, not just because of the emotion of viewing the brain, but also because emotion is itself a function of the brain. In his book Consilience, biologist E. O. Wilson argues that the separation of art and science is a modern phenomenon, and it is only by combing the two, like the Greeks of old, that we can gain new insights into both areas. And in that moment of combination, the science and the art are both rejoined and transformed. The potential for truly understanding ourselves as humans lies within that synthesis. If that is not the goal of theatre, what is? I can offer a couple of other examples for people interested in this topic. Thanks for getting it going, Edward. If you're not already familiar with the work of Back To Back Theatre, in Geelong, Australia, take a look. They are a 30-year-old company of artists with a range of intellectual disabilities, the term they have come to land on to describe their ensemble, that regularly tours major performing arts centers and festivals in the US. They'll be back next season. They also make films and videos with neuro-diverse communities and you can see some of them on their site. I will also never forget Joseph Chaikin's performance in "Texts for Nothing" at Magic Theatre back in the late nineties. It was one of several productions he either performed or directed around the world following a stroke that induced aphasia. Samuel Beckett wrote is final poem, What is the Word, for Mr. Chaikin. The subject of companies that use neurodivergent performers is fascinating and important, though for me in a a different category from what I can neuro-theatre, ie performance with neurology or neuroscience as its subject. Of course, it can be both, There is also the category of performance of theater specifically created for those on the spectrum. And theater being created by those like Chaikin who are experiencing their own neurological conditions. Like many theatrical forms, there are many variations that speak to each other, and at times they overlap. The reason that I define neuro-theatre so specifically is that I think it relates to questions of structure and style. This is a great piece, Edward. If you haven't seen Rap Guide to Consciousness and are going to be in NYC soon, it has been reprised along with two other of Baba Brinkman's best-loved shows at the SoHo Playhouse. Last year, Lab of Misfits (the world’s first neuro-design studio and public perception research space) included the show as part of a series of experiments to examine the power of live performance and the effect of those experiences on the brain. They recorded data from the brains of participants at the show using state-of-the-art surface electrode caps as they experience a video or live performance. They filmed that performance and showed the video to a different set of subjects the next day, to see what kinds of differences occur in the brain between watching live vs pre-recorded performances. We are excited to get the results of the study. I think I may have seen that video--in fact, I think we may have invited them to be part of our neuro art exhibit for The Neurology of the Soul. We actually have a lot of neuro art in the lobby, I would love for you to see it if you can drop by. Our shows are Thu - Sat at 8pm; Sun Feb 10 & 24 at 5pm; Tue Feb 12 & 26 at 7pm, through March 2, at the A.R.T./New York Theatres, 502 W. 53rd Street. Heather Berlin will be doing a talkback on Thu Feb 21 and all the artists are doing a talkback on Fri Feb 15. Let me know if you want to drop by! Fantastic article—thanks for bringing together so many great examples, and to pointing to design, Puppetry, and visual theater as rich domains of expression and investigation that go beyond the confines of descriptive language and the real human body. One side note—your line about the lack of familiarity with Asperger’s by people at the O’Neill really surprised me and doesn’t fit with my perception of folks in that population or in the greater puppetry community. In my experience, given our work in neurodiverse educational settings and the existence of a significant population of Muppet fans with AS, puppeteers are almost hyper-aware of Asperger’s and Autism, and many (including Pam at the O’Neill, Z. and Cheryl at the Henson Foundation, Aretta at the Center for Puppetry Arts, Eric and Shoshi at Sandglass Theater, Z. Puppets Rosenshnozz in Minnesota, and our team in Boston) are connected to initiatives to engage this population in new and exciting ways. Perhaps these could be future avenues of collaboration, along with other science/theater initiatives such as the Catalyst Collaborative at Central Square Theater. Thanks Roxana. I definitely know Z and Pam are well aware nowadays of all these questions of neurodiversity. My time at the O'Neill was 2005, nearly 15 years ago (Z was also in her first year attending, I believe), and part of what I was trying to highlight was that the world has radically changed since that time. In fact, despite my current immersion in that world, I think the first time I heard the term neurodiversity was about six months before that, as a meeting for people with Asperger's. It's wonderful to me to see how quickly the puppetry world has become responsive to all these issues.